Look, I know I've posted a LOT of cookie recipes over the years but I just love cookies more than any other treat. Sue me... for too much happiness! Chocolate chip cookies are one of those things that everyone loves, but has different opinions about what makes the "best" cookie. Some people like thick and cakey. Some like thin and crispy (yuck) and some people - the RIGHT people - like something in between. You know what I mean... crisp, buttery edges + soft, gooey centers with the perfect semi-sweet chocolate chunk ratio. Yep, that's the perfect CCC. I'm here today to present that cookie. It doesn't take hours of chilling in the fridge to achieve that perfect texture. Nor does it take browning butter or weird ratios of 3 different kinds of flour. Nope. This one's easy. So easy that you may be cursing me later on for sharing it! [reheat oven to 350. Line 2 baking sheets with Silpats or parchment paper. In a large bowl, cream together butter and sugars with an electric mixer over medium speed for 2 minutes. Add the egg and vanilla and mix again until blended and light. In a separate bowl, whisk together the flour, baking soda and salt until combined and then add to the butter / sugar mixture. Mix just until incorporated. Pour in the chopped chocolate and stir with a wooden spoon until incorporated. 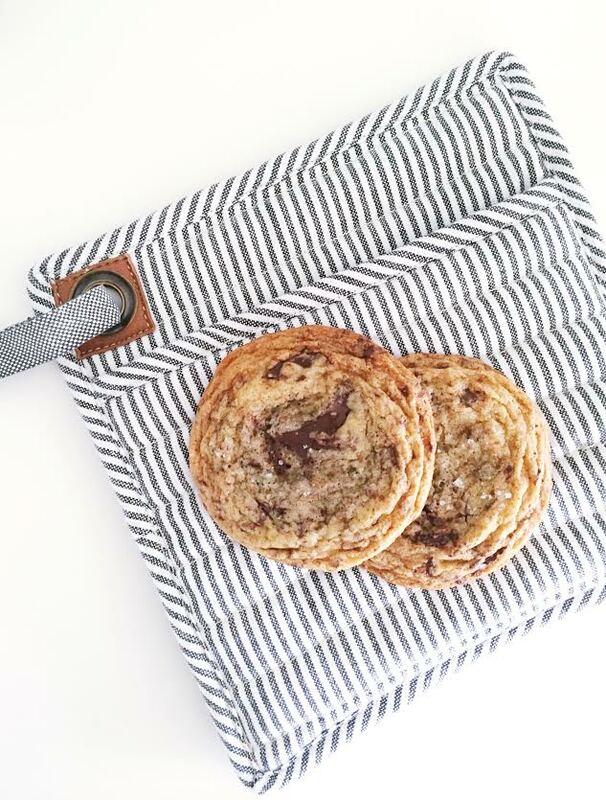 Drop the dough in heaping tablespoons (or with a cookie scoop) onto the baking sheets and sprinkle with fleur de sel (you can use kosher salt in a pinch but fleur de sel is life changingly better). Bake for 10 minutes until lightly brown and the edges are firm. Let the cookies cool for 5 minutes until transferring them to a cooling rack. Excited for your new posts!! Especially this recipe - nothing better tha a good CCC. Haha about weird ratios of 3 different flours 😂. Puh.... i´m happy i belong to the right Group of People because that´s exactly how i love my Cookies! :-) Def going to try this recipe!! Glad you are back and enjoying the summer! !